A name is simply a label to distinguish something from another. It does not create worth nor does it create true meaning. What is important is the worth of the individual or thing. One of the first things you think of when starting a blog is the title (or name) and this will set the scene of the content to follow. When my friend gave me instructions on how to start my blog, she asked me firstly “What is the name of your blog?” I knew the content long in advance, so choosing the name wasn’t all that difficult, but trying to explain it if I was ever asked could be – then again I have some experience in explaining names as mine is a name I have to repeat when asked as I usually receive blank stares or “Pardon? How do you spell that?” I am (un)fortunate enough to have been given my ouma’s name. I am not known by my full birth name, but rather a shorter abbreviation, which she too had been given. I think by having her name family members thought I had received her blessings and gifts that go with it, an expectation that I should be good in certain things: she was a GREAT baker, I’m a confident baker but not great. She was an exceptional seamstress and had the most amazing knitting machines, I find it frustrating and immensely difficult to sew on a button. She was comfortable with water colours and painting, I must have been born colour blind as I can only draw with pencil. Even though I have inherited the creative flair of my grandmother, I certainly did not excel in any of her abilities. 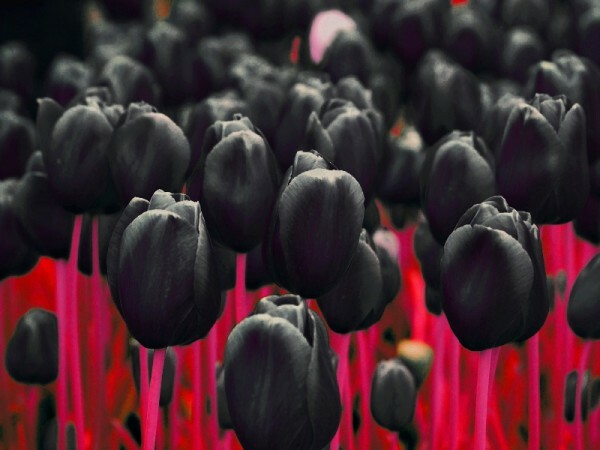 (tulip) is the most influential part. During my struggle with the two sisters, I developed not only insecurities about myself, but believed the lies that I was being told, lies such as “You’re not good enough”, “You are nothing without us”, “You can’t afford to gain weight”, “Your friends are against you, they don’t even like you very much”. These voices were constant, from the morning I wake up to the when I rest my head at night. It was not until I met my therapist, and after countless sessions, that I discovered my own voice, a new voice that wasn’t going to listen to these lies anymore (my therapy sessions will be discussed in more detail during later blog entries as this was a crucial time in my battle against eating disorders). The new voice came about when my therapist once asked me “If you could give yourself, the voice that wants to survive, a new name, what would it be and why?” I have to admit that it didn’t take me long to think of a flower. “Tulip” I answered. “A tulip – as with any other flower or plant – need certain things to blossom; sun, soil, water, basically their food, and nutrition. I see myself as this tulip, because I too need food and its nutritional properties to blossom”. I certainly surprised myself with that metaphor, as months of self-hatred seemed to be cleansed by this vision of a tulip. I felt a sense of achievement and even though this new voice wasn’t yet strong enough to fight off all the death threats from the two sisters, I have discovered the needed motivation to fight. I felt that my voice which was trapped behind a barbed wire fence, is being freed, even though fighting to get over that fence is painful at times. From that moment on, tulip became my scapegoat; a comforter at times when all I can see is ugliness, and a motivator that I am strong, I am capable, and I am me. So why (weathering)? An object that has been exposed to weather elements such as rain, hail or wind becomes eroded over time, which in turn changes the appearance of that object. We all have such elements in our life, whether good or bad, that when we bare ourselves long enough to them, we begin to change and our ‘old self’ wears away. I was exposed to some interesting remarks while at high school. Due to my athletics and gymnastics career I had a very muscular build. Yes, strength is needed when you endure hours of training per day, building the required muscle tone that will help you succeed, but for this teenage girl those changes were often a bit too much, too soon. I was called various names as my body changed, but the one name that caused the most wear, was the name ‘steroids’, given to me by the younger male athletes. It literally broke me down bit-by-bit every time they called me that. I just shrugged it off as playful antics, but over time it eroded my mind and changed how I felt about myself. Therefor weatheringtulip is forever changing, as new elements enter my life. New labels such as wife, mother, employee brings about a whirlwind of change and a flood of elements such as intimacy, pregnancy, sleep deprivation, nursing, etc. I am challenged by these elements daily, finding myself amongst it all, rediscovering my name and my self-worth, finding TULIP. If only I knew then what I know now, I would be a little wiser, a little bolder. If only I knew that I didn’t have to fight with my loved ones, cry myself to sleep, hate the person l was before the two sisters took over, deceive, lie, make myself sick and starve in order to feel like I am worthy – I would have fought even harder against it, listened to my councillors and dietician and cared about my self-worth. If only I knew that my self-image isn’t really that important to everyone else, that I am not constantly meant to be under a social microscope, that they do not depict what I think about myself – I would have discovered my own unique and somewhat crazy identity, and closed the magazines stating otherwise. If only I knew that losing an athletics’ event to someone younger, slender and with more potential at the time will eventually cause my downwards spiral into depression and self-doubt – I would have shrugged it off and said “there will eventually be someone better than you, but that doesn’t mean you weren’t good at it, because you had to beat someone else to be the best”. If only I knew that the two sisters will really kill me and they won’t stop until I have become nothing except a hollow shell, a skeleton – I would have opened my eyes and ears earlier to the truth and told them to shut up! If only I knew that spending 5 times a day curled up over a toilet bowl, purging myself from every morsel I ate, would permanently damage my teeth, strip me from a social life enjoying the company of my friends and family – I would have concentrated more on my drawing and writing as a way to escape those triggers. Now you know that you are being lied too; that the two sisters do not have your best interest at heart, that they want you to be alienated from your family and friends and that they will dig their claws into you and draw blood, draw your very last breath. You now know that you deserve to be loved, that you can be free from their judgement, that the people wanting to help you are not against you and that more than anything else, you are unique, beautiful and worthy to live as YOU! A life, any life is more than its own particulars: it has a social, historical, political, gendered, religious backdrop that gives it context and meaning. How very excited yet nervous am I to introduce myself to you – reader, blogger or the accidental passer-by. I am, in many forms, a survivor (please refrain from singing that all too familiar song…oops too late! ): I survived my first 10 days on earth, I survived several primary school crushes, I survived being the youngest sibling to an older sister, I survived falls of the gymnastics beam, I survived many “serious” and heart-breaking high school relationships, I survived (in my later young adult years) childbirth…twice!, but more than anything else, I survived food deprivation. Why blogging? A dear friend of mine introduced me to the thought of blogging after I told her that I’m FINALLY working on my memoir. At first the idea of putting words to feelings and thoughts on a blank screen was daunting, but then I remembered what my objective is with a memoir. I have, as many before me and many still to come, a story to tell; a story of living, battling, recovering and surviving a disorder I often refer to as the two sisters (but for many this disorder is called anorexia and bulimia). But unlike the memoir, which mainly focusses on that snippet of my life, this blog opens a starting point to all that is me. Unveiling myself, one layer at a time, to those who struggle with the same two sisters, those who have been indirectly affected by this disorder, but more so to those individuals who are searching for that glimpse of a faint light at the end of a torturous and often dangerous dark tunnel. My blog is most definitely a “hold on tight, it’s going to a bumpy ride” and a “I know you can’t see it now, but the end reward is so much greater”, and it is a journey I want to share with those willing to step on board. This is my story, this is my life, I am Tulip.